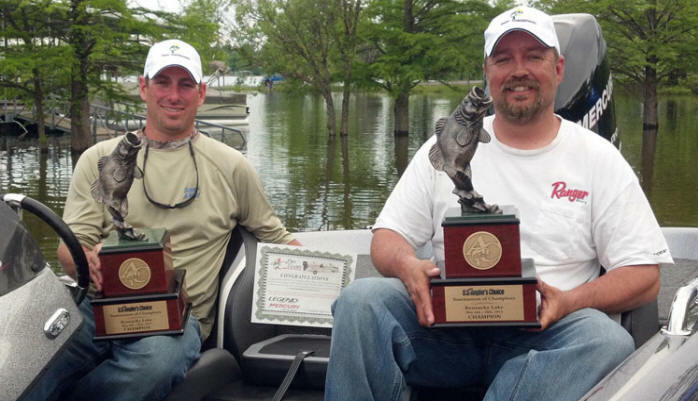 U.S. Angler?s Choice Region 3 Tournament of Champions was held May 9th thru the 10th on famed Kentucky Lake. At full pool Kentucky Lake is 184 miles long, covers 160,000 surface acres and boast 2380 miles of beautiful. This would be the stage in which 194 teams would compete, all looking for that winning pattern or area that would lend enough weight to take home one of three Legend Boats rigged with Mercury Outboards. The event was hosted by Marshall County Tourism and official lodging site for the event was the Moors Resort and Marina. Moors offered teams and families first class place to stay while not on the water and the restaurant located onsite was a fantastic places to dine. The people running and working at Moors are some of the friendliest you will find anywhere in the country. Teams gathered Wednesday for a first class banquet followed up with a short meeting held at the Kentucky Dam Conference Center. Southern hospitality was in full force as teams were treated to a fantastic dinner consisting of Fried Catfish, Fried Chicken, country green beans, scalloped potatoes, macoroni & cheese, salad, hot rolls and plenty of deserts to top it off. Following the dinner a review of the daily procedures, safety and event specific rules were covered. Teams were officially welcomed to the Resort and lake by Kelli Van Blaircom from Moors Resort. The evening was then finalized by recognizing each of the divisional anglers of the year teams and awarding plaques for their accomplishments. As teams woke on that first day of competition mother nature greeted them with a picture perfect morning, take off temperatures around 65 degrees and clear skies, the day would eventually warm up into the upper seventies. The weigh-in started at 4pm and it wouldn't take long to realize why AC Teams have the reputation of being the best local level anglers in their area. 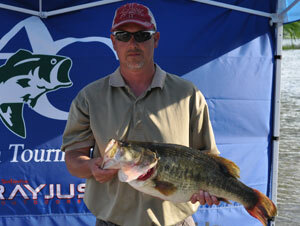 These teams would weigh-in 812 bass weighing nearly 2,500 lbs . What a testament to the caliber of our anglers. When the scales closed after day one the Wappapello team of Chris Sarakas and Randy Seabaugh found themselves on top the leader board with a five fish limit that saw the scales reach 27.39lbs. This bag was anchored by the largest fish we have ever weighed in a Region 3 Championship. This behemoth of a bass weighed in at 12.08lbs, truly a giant anywhere in the country! The fish was taken on a watermelon colored Brush Hawg in about 6-8ft of water. It was positioned just in front of the bushes and it and all of their fish were caught in a couple hundred yard stretch of bank. Day two saw rains move through the area just prior to take off but the weather cleared quickly and the sun busted through around noon, it didn't seem to have any major effect of the biting fish as big bags continued to make their way to the scales. Minutes after the last bag was weighed the results were in. The team of Jason Hodge and Lonnie Bowlin would remain consistent and gain two spots on the board. That consistency earned them the title of Region 3 Champions. The team brought heavy bags to the scales each day. On day one they weighed in 25.14lbs and followed it up on day two with 23.29lbs giving them a two day total of 48.43lbs and the win. 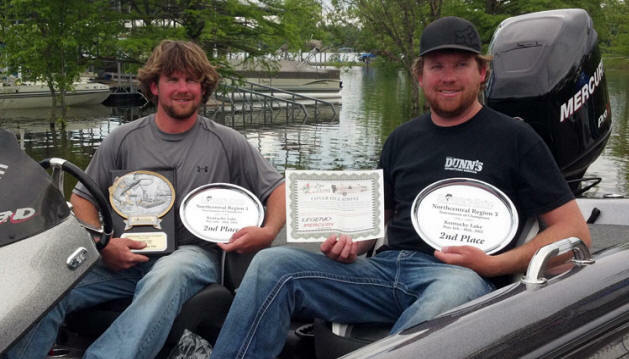 The team reported fishing shallow water and flipping bushes during the entire event. They focused their efforts in one very small bay south of Paris Tennessee and utilized jigs and soft plastics to catch their fish. For the win the team takes home a certificate for a new Legend Alpha 191 with a Mercury 200 Pro XS plus an additional $1,450.00 in cash. Coming in second place was the team of Zach and Jake Ziegler. On day one the team weighed a five fish limit of 19.85 lbs. and followed it up on day two with 25.85lbs giving them a two day total of 45.70lbs. The day two bag was anchored by a 9.56lb giant earning them Big Bass for the day. The team reported catching their fish on a deep crankbaits on day one but had to move to the bank on day two. They then flipped beavers, brush hawgs and spinnerbaits to get their bites. The big fish was fooled by a spinnerbait. For the second place position the team wins a certificate for a new Legend LE 186 with a Mercury 150 OptiMax and they also took home $2,300.00 in cash! Taking the third place position was the team of Eric Foister and Don Davis. They brought 5 fish to the scales on day one weighing 26.37 lbs but struggled a bit on day 2 on day two with a limit weighing 15.62lbs. giving them a two day total of 41.99 lbs. The team elected to fish south of Paris and focused their efforts on main lake banks, their baits of choice were sweet beavers. The team took home $6,344.00 in cash and prizes! The luckiest team at the event by far was Jeff and Jon Toomer. They ended the event in 121st place but was the last team standing for the attendance prize of a Legend LE 186 rigged with a Mercury 150 Optimax! Congrats! An amazing 1,476 fish were brought to the scales. Day 1 big bag: Chris Sarakas and Randy Seabaugh 27.39 lbs. Day 2 big bag: Zach and Jake Ziegler 25.85 lbs. Day 1 big bass: Chris Sarakas and Randy Seabaugh 12.08 lbs. 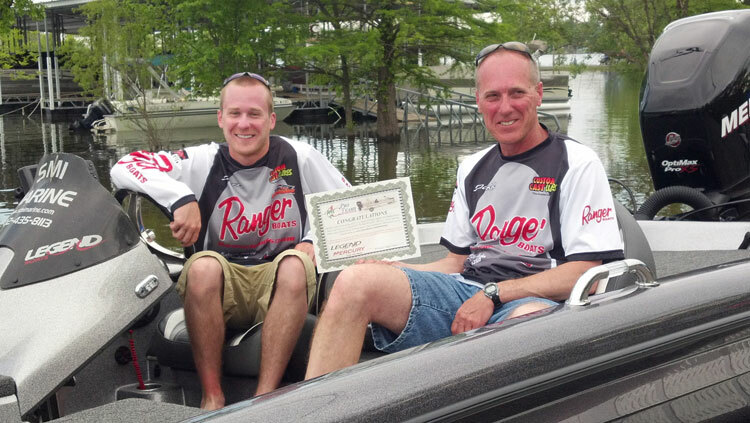 Day 2 big bass: Zach and Jake Ziegler 9.56 lbs. If you were unable to fish this season or make it to the championship come join us in 2011! Call 618-496-3610 for a trail near you. The thoughts and prayers of everyone within the Anglers Choice family go out to the family of Tim Clippard of Jackson, Missouri who lost his life in a tragic accident. 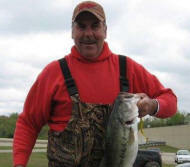 Tim was 51 years old and an avid angler that fished the Wappapello Division. Memorials may take the form of contributions to the First Baptist Church in Jackson Missouri, the Nolan Weber Cancer Fund, St. Jude's Children's Research Hospital or a church or charity of donor's choice.